TheWest Highland Line is one of the most scenic railway journeys in the world. This linear walk follows the track from Tyndrum to Bridge of Orchy, in the shadow of mighty Ben Dorain. Once complete, hop on the train at Bridge of Orchy to make the return leg. From the public car park adjacent to the village shop in Tyndrum, set off up the narrow surfaced road that runs by a couple of houses to reach the village hall at the top. The walk continues along a well-made track and heads steadily uphill with the main road over to the left. It flattens out after a large water tank is passed and, a short way on, crosses the river and railway by solid stone bridges. Cross the first of many stiles, turn left and follow the path running north through the glen, alongside the railway. Ahead Beinn Dorain, a popular Munro, dominates the view. The walk follows the West Highland Way, a long distance path stretching from Glasgow to Fort William. A way marker post (a thistle within a hexagon) keeps you right here, directing walkers along a stony path. It climbs steadily, then falls, passing beneath the railway via a narrow underpass. Cross a stile, leading on to a wide track. Turn right and follow this alongside the Allt Coire Chailein, descending into Auch Gleann. 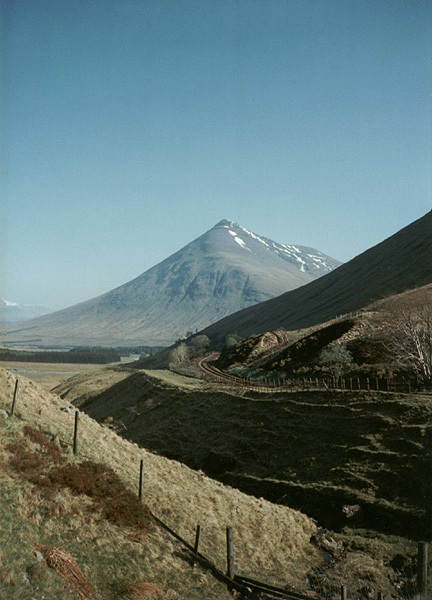 As you round the slopes of Beinn Odhar, look up to the right to see the impressive horseshoe curve and viaduct that takes the railway across the glen and on to the lower flanks of Beinn Dorain. The West Highland Line between Craigendoran, near Helensburgh, and Fort William officially opened on August 11, 1894. The Swiss-style station buildings at Tyndrum and Bridge of Orchy are typical of the architecture on the railway. However, both they and the signal boxes are no longer manned ' the whole line is controlled from a signalling centre at Banavie, near Fort William. In the base of the glen, cross a bridge over the Allt Kinglass and, on the other side, turn left, going over a stile, and continue along the track. The route rises gently and, a little over a mile on, crosses the railway again, next to an old cottage now used by a mountaineering club. The track skirts below the crags of Beinn Dorain, up to the right, and soon Bridge of Orchy looms into view. The final stage is easy and brings you down to an underpass entering the station. The best way back to Tyndrum is by train, although there are also regular bus services. If you make the return by train, you will need to find your way from Tyndrum Upper station back to the car park by the shop. To do this, head down the access road from the station to join the A85. Turn right and walk north along the pavement through Tyndrum to the car park. If you decide to make the return journey by bus, you'll find the stop on the A85 outside the Bridge of Orchy, a short walk from the station. Map OS Landranger sheet 50, Harvey's West Highland Way. Start/parking Public car park next to village shop and newsagent in Tyndrum. GR: NN 328307. Grading Well-graded, low level route with track and path throughout suitable for all ages and abilities. Sheep grazing in places, so dogs will need to go on the lead.